A single player game. play with computer players. Simply download and play. No configuration needed for you to start. You can get more fun if you spend a little time in setting up computer plays. 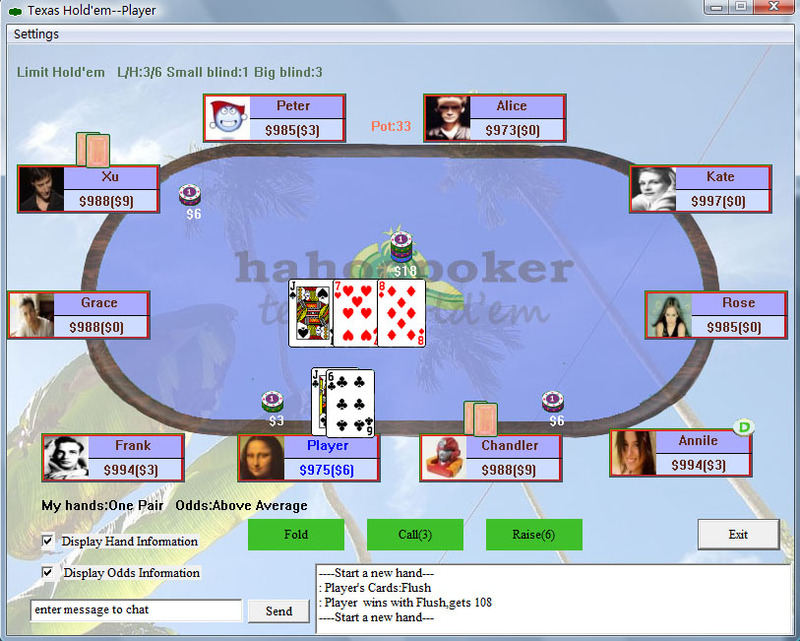 Hahoopoker Features: Play with computer; Easy to use; Able to configure the game table by yourself; Flexible configure the computer players; Set up your own users; History hands analysis; Choose the table background,the card back, the game speed. A Single player Texas hold'em game, with vivid picture and animation. Resume transfer of large files to any pc. No FTP required, No email attachments. The program for the account of the personal finance. A window gadget - personal organizer. Qweas is providing links to Hahoopoker Personal Edition 1.80 as a courtesy, and makes no representations regarding Hahoopoker Personal Edition or any other applications or any information related thereto. Any questions, complaints or claims regarding this application Hahoopoker Personal Edition 1.80 must be directed to the appropriate software vendor. You may click the publisher link of Hahoopoker Personal Edition on the top of this page to get more details about the vendor.